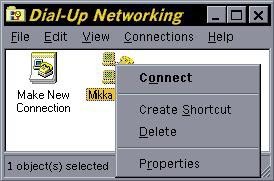 Double click "Make New Connection"
Select a name for the connection icon we'll make (it's called a connectoid). 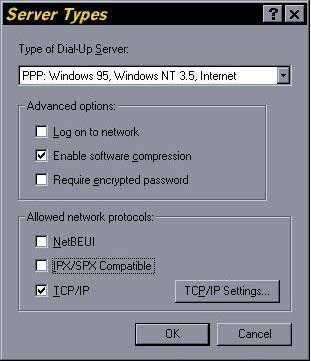 Make sure the modem is in the modem window. look like the picture below. Keep hitting Next and Finish to finish our connectoid. Enter the area code and phone number in the right slots. 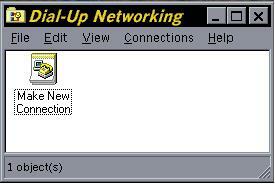 Click on the "Server Types button"
Make sure the type of Dial Up Server is: PPP:Windows 95, Windows NT 3.5, Internet. 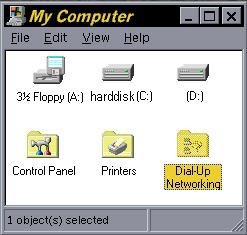 Click on OK until you get back to the dial up adapter window. We're ready to go now! 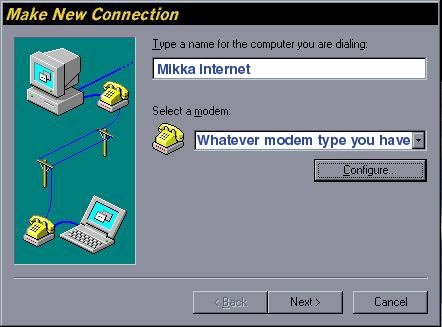 Double click on the Mikka Internet connectoid. Click on "Connect". 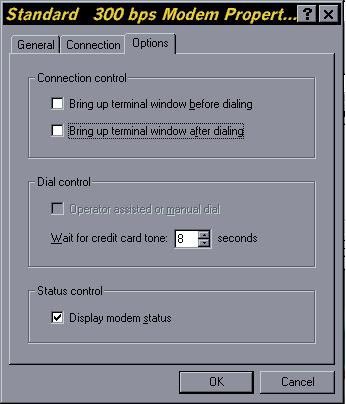 The modem will dial and you'll hear a screeching noise as the modems start talking to each other.